...to make way for Big Sunscreen! I've got a hankering for front-page news, and I can't seem to find my copy of the LA Times, the Washington Post, or even the Winnipeg Free Press. I guess I'll just have to settle for my trusty copy of the Fabutan Observer! Wow! 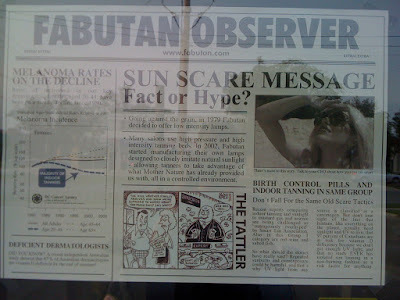 Fabutan has their own newspaper? Cool! Let's take a closer look, shall we? 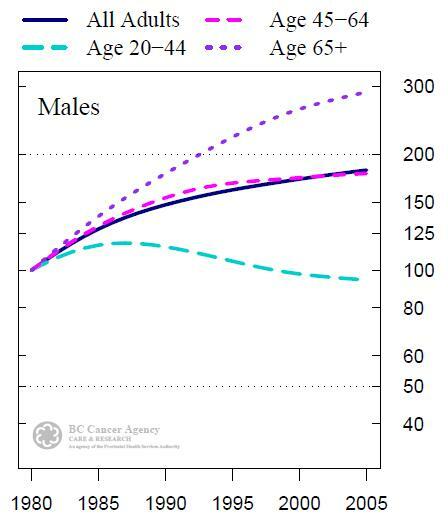 Rates of melanoma in our key demographic, females aged 20–44, have been on a steady decline since 1980. I was unable to find statistics that either validate or dispute their assertion that the majority of indoor tanners are aged 20 – 44, but it seems reasonable. I was able to find a study that seems to verify that the majority of tanners are female, but it is a pediatric study. 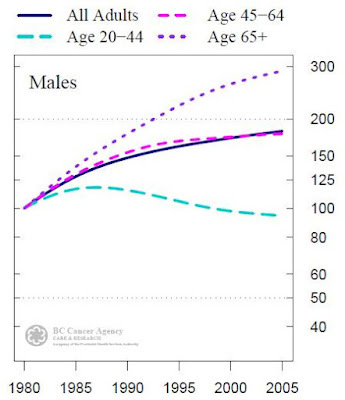 Looking at both male and female trend lines for all adults, however, we see neither a marked upward or downward trend in the incidence of melanoma in females, while it's easy to make out the upward trend in the male population. Also, melanoma is not the only variety of cancer caused by exposure to ultraviolet radiation. Regardless, there is no data available that lets us separate those who make use of indoor tanning beds from those who do not. Personally, I would hypothesize that any decrease in melanoma incidence may be related to increased sunscreen use, which is of course not used in the tanning bed. Let's move on. DID YOU KNOW? A recent independent Australian study showed that 87% of Australian dermatologists are vitamin D deficient by the end of summer? I still don't! But seriously, dermatologists not getting enough vitamin D? Shouldn't they know better? Perhaps that's why they're not getting enough vitamin D. We're given no information with regard to how deficient they are, only that they are deficient. It's possible that their alleged vitamin D deficiency could be explained by the fact that, as dermatologists, they are intimately familiar with the dangers of over-exposure to ultraviolet radiation. I briefly considered the possibility that Australian foods were not fortified with vitamin D, but it would seem that they have similar voluntary fortification programs for dairy products, and indeed have a mandatory vitamin D fortification requirement for margarine, which we lack in North America. In 2002, Fabutan started manufacturing their own lamps designed to closely imitate natural sunlight – allowing tanners to take advantage of what Mother Nature has already provided us with, all in a controlled environment. Well golly-gee, that sounds great! I truly adore the naturalistic fallacy [edit: appeal to nature]! Will Fabutan also provide us with a way to get the arsenic and earthquakes that Mother Nature has already provided us with, too! The Coppertone Girl hasn't aged well. Why should you tan? Because Big Sunscreen doesn't want you to! I feel the need to mention that I didn't just make this up. These photographs were not doctored in any way. That's the sad part. The sad, sad, hilarious part. I assume that I don't even need to mention that Fabutan is also trying to make money, here. But I did mention it, didn't I? Uh, what? Non sequitur, much? I really don't know what to say to this. Nothing in the "article" below this headline says anything about birth control pills. Am I missing something? My sanity, perhaps? Recent reports comparing indoor tanning and sunlight to mustard gas and arsenic are being challenged as "outrageously overhyped" by Smart Tan Association. Oh, these allegations are being challenged by the Smart Tan Association? That sounds like a perfectly objective consumer advocacy group with the best interests of the public at heart. Oh wait, they're actually an indoor tanning lobby group and "business solution provider"? Who would have guessed? There’s no safe way to get a tan. Just like the sun, tanning beds and sun lamps release ultraviolet (UV) rays that trigger the tanning process in the skin. This causes skin damage, such as sunburns, premature aging and cataracts. Also, long-term exposure to UV rays, sunburns either from the sun’s rays, tanning beds or sun lamps, can put you at greater risk for non-melanoma or melanoma skin cancers. No it’s not. It might make you feel good but when your skin colour changes, you’re damaging your skin and that can lead to premature aging and skin cancer. If you have to have that tan, try asunless tanning cream. It will last about a week. Just remember that when you’re using a fake tanning product, you’ll still need your sunscreen. I don’t think so! A tan offers very limited protection from sunlight or burning. Some tanning beds can expose you to five times as much radiation as the sun. So it’s definitely not a reason to be spending time in a tanning salon. You could but you don’t need that much exposure to UV rays. A few minutes a day of unprotected sun exposure is usually all that is needed for people to get enough vitamin D. For most people a little sunlight goes a long way. In the fall and winter, a supplement is a much safer and cheaper way to get your vitamin D.
This Fabutan advertisement is neither more nor less than a sad propaganda piece. Shame on you, Fabutan. 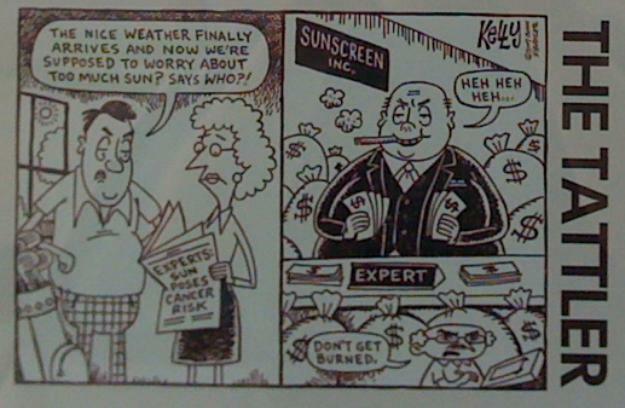 But seriously, watch out for Big Sunscreen: they're out to make a buck, and they don't care who they hurt! Edit: This issue proved contentious. In the interest of transparency, I have left this post unaltered (with the exception of this addendum), but you can find the follow-up here. preparing your skin for summer is a good thing. Either put it in moderation indoors... or go outside not knowing the UV index, an just burn yourself??? Looks like the fabutan has done their research...WAY TO GO! The writer of this column should think about going back to school. It's awesome to see someone with one-sided research. I dont even really tan or work at a tanning salon and this angers me because you left out quite a few notes! Number one... it is pretty obvious why MEN's skin cancer cases have increased... Men are more likely to work OUTDOORS and burn and are less likely to tan or even to use sunscreen. Women are tannign salons target audience so your reasoning makes no sense. Also... YES Fabutan is tryign to make money. Who isn't? But the difference is tanning isn't a Multi-billion dollar a year industry like the sunscreen industry. "h, what? Non sequitur, much? I really don't know what to say to this. Nothing in the "article" below this headline says anything about birth control pills. Am I missing something? My sanity, perhaps?" You are insane. Last year the Canadian Gov't issued tannign beds as a carcinogen... teh same level as BIRTH CONTROL PILLS, salted fish and red wine! That's where that came from. So pretty much our gov't says you have jsut as much chance of getting cancer from drinking red wine as using a tanning bed. Also just to let you know... anybody that lives north of Atlanta, Georgia doesn't get enough vitamin D from the sun in the winter months... here in good old Canada that is just about 6 months! Half a year! You would need to drink about 8 glasses of milk a day to get the minimum amount of Vitamin D from milk. People just have to be black or white... no ne knows what grey is anymore. Too much or too little of anything is bad! 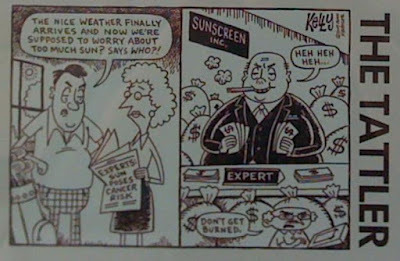 Yes teh studies have been done... tanning beds apprently cause cancer... OH WAIT did they mention that sunscreen companies funded these studies? oh and did they mention they included skin type one tanners? Skin type one tanners include albino or fair skinned, freckled people who are discouraged to tan indoors and outdoors because they burn very easily. The guy who wrote this has a degree in Computer Science....not a phd in medicine of any sort. Therefore his claims against the tanning industry and more specifically Fabutan are not only outrageous they are also very misinformed. Good Job dummy way to make yourself look moronic! I would just like to know if you went into that Fabutan and talked to one of the staff? They attempt to educate their clients about both the benefits and the risks of tanning. They promote SMART TANNING as opposed to safe tanning, as there is no such thing. First of all, thank you for your comments. I certainly appreciate the input and the opportunity for discussion on this topic. As my response exceeds the 4,096 character limit imposed by Blogger, my response to your comments can be found here. By looking at your picture I am assuming you are unable to tan. Those of us who enjoy the outdoors and other sources of vitamin d find your comments some what amusing...just like you are. I would go back in to the basement where you dwell and eat your sandwhich. If you're not interested in making an argument that is both logically valid and sound, I have no interest in continuing this discussion. Wow I think my 8 year old is smarter than the guy that wrote this article.